Mayo Clinic’s new Regenerative Sciences Training Program — one of the nation’s first doctoral research programs in regenerative sciences —prepares researchers to accelerate the development of cutting-edge diagnostics and therapeutics. Students in the program will graduate from Mayo Clinic Graduate School of Biomedical Sciences with a doctorate in biomedical sciences with an emphasis in regenerative sciences and one of seven Ph.D. tracks. Mayo Clinic Center for Regenerative Medicine is funding up to 16 five-year fellowships. 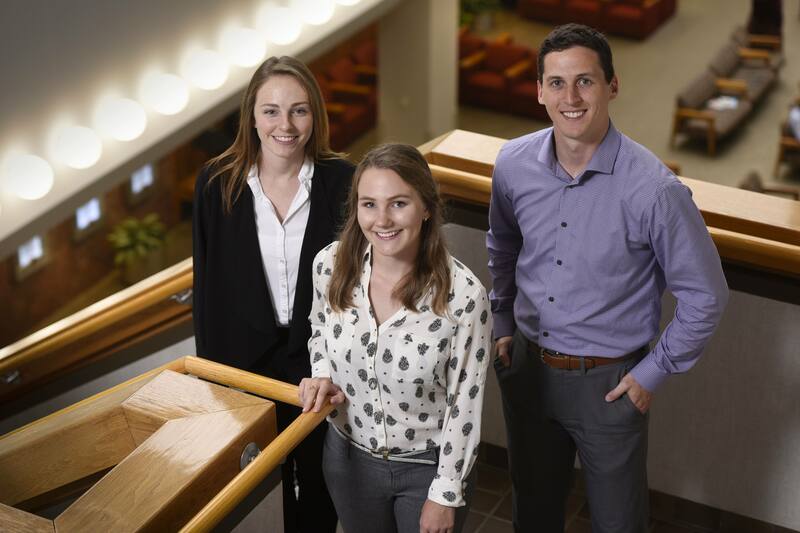 From left: Emma Goddery, Paige Arneson, and Christopher Paradise, comprise the inaugural cohort of Ph.D. students in Mayo Clinic's Regenerative Sciences Training Program. Paige Arneson, who earned bachelor’s degrees in biology and chemistry from the University of Wisconsin–Superior in Superior, Wisconsin, is specializing in biochemistry and molecular biology in the lab of Jason Doles, Ph.D. Her research focuses on the loss of muscle mass associated with disease and aging. In healthy young people, stem cells called “satellite cells” regenerate muscle as needed. Preliminary evidence from her research indicates that the metabolism of satellite cells is important for maintaining this regenerative ability. She plans to more precisely define what goes wrong with satellite cells in disease and aging and pave the way for therapies that allow these stem cells to properly regenerate muscle and restore health and function. Emma Goddery, who earned a bachelor’s degree in engineering from Arizona State University in Tempe, Arizona, is specializing in neuroimmunology in the lab of Charles Howe, Ph.D. Her research focuses on understanding inflammation and strategies to alter inflammatory responses in the central nervous system to improve future treatments that regenerate damaged neural tissue. Many neurodegenerative conditions are either caused or accompanied by abnormal inflammation in the central nervous system. Her research analyzing brain inflammation in mice will be among the first to analyze which specific immune reactions help vs. hinder the ability of transplanted neural stem cells to heal and regenerate damaged areas of the brain and spinal cord. “This program seemed like a perfect way to marry my scientific interests in immunology, neurology, regenerative medicine and biomedical engineering with an interdisciplinary, collaborative field that holds immense promise in transforming health care,” she says. Christopher Paradise, who earned a bachelor’s degree in biology from St. Olaf College in Northfield, Minnesota, is specializing in molecular biology and experimental therapeutics in the lab of Andre van Wijnen, Ph.D. He worked two years as a Mayo Clinic researcher, studying mesenchymal stem cells, which are capable of regenerating muscle, bone and cartilage, before pursuing his doctorate. His research focuses on understanding the mechanisms that control how and when multipotent stem cells commit to a specific type of tissue, such as muscle, bone, fat and cartilage. Delineating how genes and epigenetic factors (biological mechanisms that regulate gene expression) control this process will aid in the development of regenerative therapies for musculoskeletal diseases and injuries. Ultimately, the aim of this work is to use and instruct a patient’s own stem cells to regenerate damaged or diseased tissues within the body. “I applied to the program because it provides an unparalleled opportunity to gain exposure to the field of regenerative medicine,” Paradise says.